Yesterday, the House passed a bill that prevents federal funds from going to National Public Radio, mainly because Republicans want to make a point about the government paying for content they disagree with. According to the Washington Post, the bill passed 228 to 192, with all Democrats opposing it and all Republicans supporting it, except for Rep. Justin Amash who voted "present." 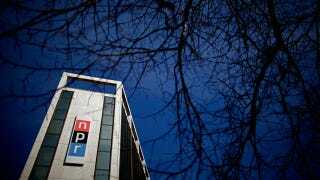 During a long debate, Democrats pointed out that cutting the $5 million NPR receives annually won't actually reduce the deficit at all, it would just hurt small, rural stations. The Senate is unlikely to take on the bill, and Rep. Louise M. Slaughter said it was a, "purely ideological bill so members can go home and brag about what they have done to NPR" during the recess next week. NPR, National Endowment for the Arts, National Endowment for the Humanities, all those kind of frivolous things that government shouldn't be in the business of funding with tax dollars — those should all be on the chopping block as we talk about the $14-trillion debt that we're going to hand to our kids and our grandkids ... Yes, those are the type of things that for more than one reason need to be cut. As the L.A. Times points out, "every major civilization in world history has also prominently funded the arts." But clearly Palin doesn't think art is something "real Americans" value — even though the nonprofit arts and culture industry generates $166.2 billion in economic activity every year, and supports 5.7 million jobs. All of those people are probably liberals anyway, so who cares if they're unemployed?